Car floor mats are custom made to preciously fit the distinctive features of the floor for each car model. This is the guarantee of safely placed mats, which are fixed with standard car vendor equipment. Floor mats are made from contemporary eco-friendly materials, which are similar and for certain characteristics even better than natural caoutchouc. This product is resistant to alkali, acids and other chemical agents, which can get into your car with the snow slush on footwear. Special material, which the floor mats are made of, ensures complete protection against dirt and stains. 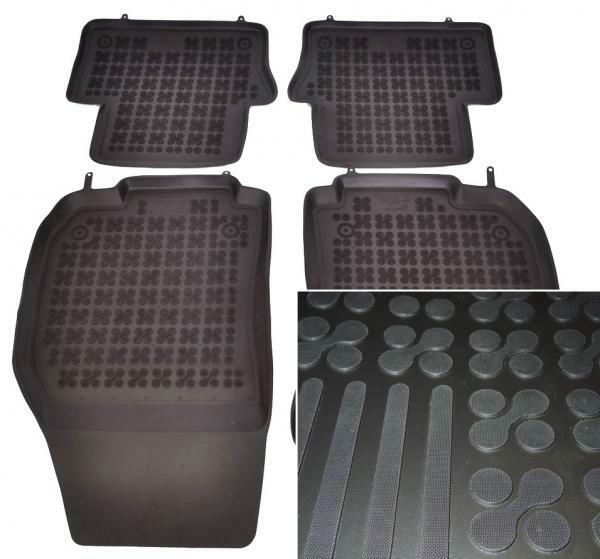 Specially designed high edges (3-4 cm) of the cargo mats assure high liquid holding capacity, and the relief pattern on the mats adds anti slip properties. a)	Cut off the hooks (1) on which the floor mats were hung up. c)	In the prepared holes, from underneath of the floor mat put the bottom elements of clips (3) in. Place the floor mat on the car’s floor, so the pins (if there are ones) originaly mounted on the floor go through the holes. Put the upperelements of the clips (4) on the pins and press until they shut. 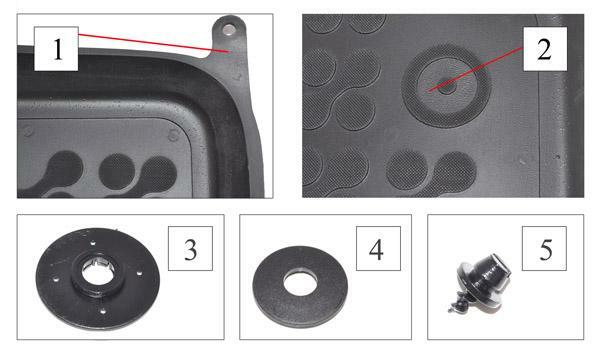 d)	In case there are no holes or pins on the car’s floor origginally, please go over the following steps at first: *Place the floor mat on the car’s floor and locate the spots to be used for the clips. Attention: please make sure the driver’s floor mat is not blocking the pedals. *With a sharp tool (screw or needle tool) make holes in the original carpet. Attention: be carefull not to damage the metal base of the floor. *In the holes install the plastic pins (5). Then go over the steps 1-3.